If someone asked me to characterize the problem sets (for both divisions) in one sentence, I would say "pay attention to details, it will pay off twice." This time my goal was to make a problem set that would lead to an interesting challenge phase. And so it was --but let's start at the beginning. Most Division 1 coders started the day by opening the easy problem – a string parsing problem where the most difficult part was to check whether a part of the string represents a valid date. When it comes to dates and times, it's good to be careful, and so it took a while until we saw the first submission. (Its author was no surprise at all. Try to guess and verify it below.) In the next few minutes, we saw a plenty of submissions on the easy problem and then... nothing. Three minutes later we saw the first submissions of the medium problem. In a matter of seconds, four coders submitted their solutions. It's almost unbelievable how balanced the top coders are. At 52 minutes into the competition andrewzta submitted his solution for the hard problem and took the lead, being the first person to complete the set... or not? Sadly for him, testing revealed a hidden bug in his 1000, and eight minutes later he had to resubmit. Submissions continued to pour in. When the coding phase ended, the coders could take a look at the division summary, only to discover that none of the competing targets had submitted the hard problem -- in fact, the best performance among the targets was Petr's, who was in 22nd place. But that was all about to change when the challenge phase started. Day equal to zero? A string of zeroes ending just outside of T? The volume of a 1×1×1 pyramid? The possibilities to gain points were almost endless, and many coders used them to move up the ranklist. For example, jakubr's six successful challenges (and one wrong) brought him to 6th place overall. Other good challengers were Vytenis (7 good, 1 bad, 11th overall) and zmaks (5 good, 17th overall). During the challenge phase the leader changed almost every minute. We saw andrewzta leading the pack, then HiltonLange, not2knight, ... and in the last minutes of the challenge phase Per claimed the top spot for a while. But the challenge wasn't over yet. After the system tests we saw that only two coders had solved all three tasks: the SRM winner and new target Egor, and fellow Russian andrewzta. Speaking of fellow Russians, just look at the next three places: not2knight, Petr and falagar are all from Russia, too. Quite a day for them! The Division 2 match was pretty similar to what was happening in Divion 1. The coders started off with a pretty easy 250, then solved the same two problems as the Div1 easy and medium. The Div1 medium / Div2 hard problem proved to be too tricky for this division – due to the time pressure, none of the 62 submissions was flawless. Newcomer ilyaraz was the first to submit both the easy and the medium problem. But with a tricky medium and hard, even this was not enough to win the division. Several more experienced coders were much more successful in challenging, and the challenge phase was what determined the top spots in the division. A notable event were EmperorofUnivrs's challenges (9 good ones and a bad one) which gave him 12th place overall with only the easy problem solved. The top three places were claimed by AJA, hutelang and arviman. Each of them had to make at least 4 successful challenges to get to the top. An easy problem to get everyone started. It can easily be seen that the constraints in the problem statement really define a chessboard-like pattern. Consider the squares (0,0) and (i,j). If (i+j) is even the squares have the same symbol, if (i+j) is odd they have different symbols. Thus the symbol at coordinates (i,j) depends only on the value (i+j) modulo 2. In addition, we know that the symbol at (rows-1,0) is a dot. This gives us enough information to fill the whole chessboard at once. This was an example of a real life problem. We can split the checking into several logical steps. And if we can do this, it's almost always a good idea to actually do it. The resulting code will be much less error prone. Is the number divisible by 11? Does it contain a valid date? The divisibility by 11 is simple to check – just convert the string to a 64-bit integer and use the built-in modulo operator. For the validity of a date we will start by introducing some helper functions: The function isLeap(year) will compute whether the year is a leap year, and the function getDaysInMonth(month,year) will return the number of days in the given month. Note that we need to give the year as the second argument to handle leap years properly. By far the most common error was forgetting that neither day 00 nor month 00 (or 50) is a valid input. This was one tough ad-hoc problem. The problem statement is short and simple, for the whole time it is clear what to do, and almost clear how to do it. Still, to more experienced coders the problem statement seems to scream "mind the details"! Slowing down and making sure you didn't miss anything is a good investment whenever you encounter a similar problem. So, let's approach the problem slowly. We will split the solution into four cases, depending on whether the patterns P1 and P2 contain at least one '1'. The simplest case is when both P1 and P2 contain only '0's. In this case for any zeroCount the answer is simply 0. If there are at least zeroCount '0's at the beginning, the answer is 0. Else, there may be a longer string of '0's that starts within the first occurence of P2, contains 1,000,000 occurences of P1 and the beginning of the second P2. If zeroCount exceeds the length of that substring, the answer is -1. The last remaining case is when P2 has only '0's and P1 has some '1's. In this case S will contain an arbitrarily long zero substring, the trick is to find whether it occurs soon enough... and for small zeroCount you also shouldn't miss the chance of seeing the substring before you even get to the first P2. Thus, first we check whether P1+P1 contains a long enough substring. If not, the first occurrence will be a substring of "tail zeroes in P1 + several times P2 + leading zeroes in P1". We can easily compute the smallest number of P2s we need. Now all is left is to check whether this substring occurs early enough in S. To avoid overflow, in my solution I used binary search to find the largest N such that T contains a part of S(N). In this task we have to deal with probability in a setting when there is an infinite number of possible outcomes. In many such situations, geometry may help. Let's start with a simple example. Suppose I have a stick 1 meter long. I break it in a random place. What is the probability that both parts will be at least 40 cm long? If the breaking point falls into A or C, one of the sticks will be too short. On the other hand, if the breaking point falls inside B, both sticks will be long enough. Thus the probability is (length of B) / (length of the stick) = 20 / 100 = 20%. Clearly, Johnny has to spend (travel + travel + travel) minutes traveling. We may subtract these from timeLeft and forget about them from now on. If all values in wait are zero, the outcome is clear and we output it immediately. If Johnny had to ride only one bus, we get a very similar problem. 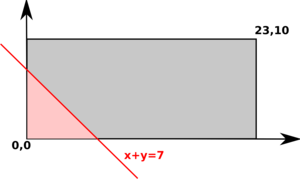 The stick will represent the interval [0,W], and the good part of the stick will be the interval [0,min(timeLeft,W)]. Note that we get this case when two of the values in wait are zero. Now it starts to become interesting. The possible outcomes can no longer be mapped to a stick. Instead, we have to use two dimensions. Let WX and WY be the maximum wait times for the two buses. All possible outcomes of Johnny's trip correspond to points inside an axes-parallel rectangle with corners in [0,0] and [WX,WY]. Good outcomes will correspond to those points [x,y] where x+y≤timeLeft. Let's take a closer look at how the set of good outcomes looks like. The lines "x+y = constant" are parallel and have a 45 degree angle with the x axis. The good outcomes are those on this line and in the halfplane to the left of it. In the pictures the good outcomes are in pink. The answer in this case, of course, is (pink area) / (rectangle area). 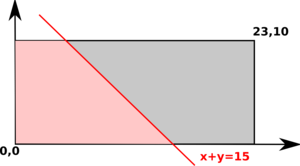 In cases corresponding to the images 1 and 3 we just need to compute the area of a right triangle, in the second case a right trapezoid. Elementary school math is enough here. 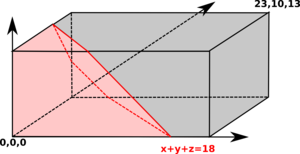 You may note that the second case only occurs whenever one of the rectangle's dimensions exceeds twice the other. The concept for the next step should be clear. All outcomes = a WX × WY × WZ box. Good outcomes: everything on or below the plane x+y+z = timeLeft. The problem is that computing the volume can be quite ugly, and the number of different cases is much larger than before. Sure, there is an O(1) solution, but let's think how can we make our life easier. One possible trick: Consider an arbitrary horizontal cut through our box. Suppose that Y is the height of the cut. What we get is a 2D version of our problem with x+z <= timeLeft-Y. Using the area() function as defined above, we can express the area of the cut as area(WX,XZ,timeLeft-Y). Imagine that we start with the cut at Y=0, and now start to increase Y. How will the area of the cut change? For a while it may be constant, then it will decrease, until it's zero or we get to Y=WY. Repeat the above process (moving the cut from Y=0 upwards). When will the type of the area change? Clearly, this will happen whenever the cut passes through a vertex of the "good outcomes" polyhedron. Now our goal will be to cut the polyhedron into pieces so that in each piece all cuts will have the same type. We can do this without even computing where the polyhedron's vertices are. How? Note that all vertices of the "good outcomes" polyhedron had integer coordinates. Suppose that we make a horizontal cut at each integer Y. This will divide the polyhedron into WY pieces, each 1 unit tall. Clearly, there are no vertices of the polyhedron inside any of the pieces. Now let's consider an arbitrary piece and take a closer look at the integral we are computing. Clearly, for the first case (area is a triangle) and the third case (area is all but a triangle) area(WX,XZ,Y) is a quadratic function of Y. 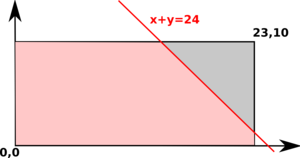 For the second case (area is a trapezoid) area(WX,XZ,Y) is a linear function of Y. (For the two boundary cases area() is clearly a constant function.) This means that in each of the pieces we are integrating either a constant, a linear, or a quadratic function. And here comes the beauty. We don't have to know which case we integrate. The trick is to use Simpson's Rule to compute the value of the integral. For general functions Simpson's Rule is just an approximation of the integral, but for up to cubic polynomials the output is exact.